Ask a young child, “What’s your favorite thing to do?” and the answer you’ll often hear is simply, “Play.” Children love to play, no matter what culture, background, or language they are from, and when a child is forced to grow up and work too early, it’s a heartbreaking loss of their childhood. In America, children don’t typically lose their playtime due to child labor or performing primary caregiving tasks for their younger siblings, but some children are still at a risk of not getting enough informal play. Here are some reasons why this unscripted playtime is an important part of your child’s early education. You might not think that anything “educational” is happening while your child plays, but playtime is a key to childhood brain development. While your child is playing, they are thinking about the objects and people they are interacting with, and they are forming valuable and meaningful conclusions about the world in the process. 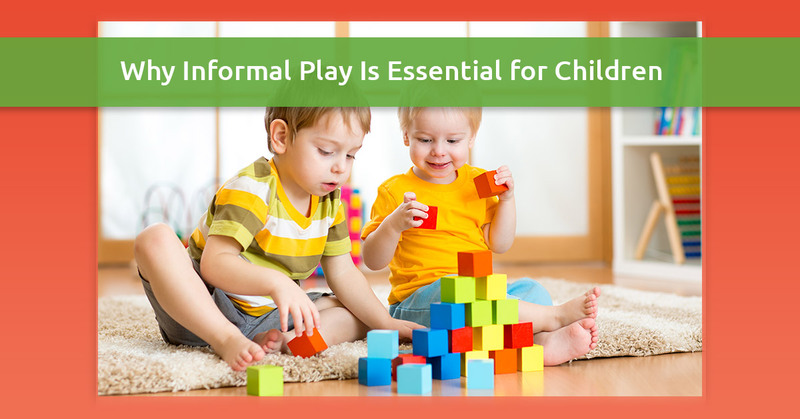 It’s critical for your child to develop the ability to navigate social situations, and informal play is a great way to improve your child’s social development and awareness. For instance, if your child is pretending to buy things at a grocery store, they are role playing the role of the customer and/or the cashier, and they are learning about social interactions in the process. When children play school or house, they are taking on the role of the adults they see around them, and this stretches their minds to empathize with the characters in that role. The interaction with other children in the game also provides valuable feedback. For instance, it quickly becomes clear that if you hit someone, get angry, or take what someone else is playing with, it will not go well. On the other hand, if you cooperate, share, and be friendly, the game will go on splendidly. Even very young children can begin to grasp these cause-and-effect relationships, especially if an adult is closely supervising their play and can intervene to set things right if anything goes sour. Physical trainers, teachers, journalists, and others are sounding the alarm: Kids are increasingly unable to run, jump, or catch, even by the age of 12. If kids miss out on learning how to move their bodies during childhood, they will become adults who are at a much higher risk of injuring themselves or falling. Children don’t realize that they’re developing their motor skills, balance, flexibility, and reflexes while they’re playing, but they are. Doing this through play is much more enjoyable and effortless than doing it through remedial physical therapy later in life. Anyone who has had kids will realize that children don’t always automatically know how to play. It often takes a bit of adult interaction to get them started. However, once their imaginations take wing, they can keep themselves occupied for hours in the stories they create for themselves. Kids who spend extended time on electronic devices end up suffering the decay of their ability to imagine, robbing them of a crucial skill that’s needed for the problems in the world that our next generation will be faced with to solve. When you enroll in Rainbow Chimes daycare, you’ll be placing your child in an environment where we foster learning through informal play. Start the enrollment process today!